Show off those delicious baked goods in this classic display case. 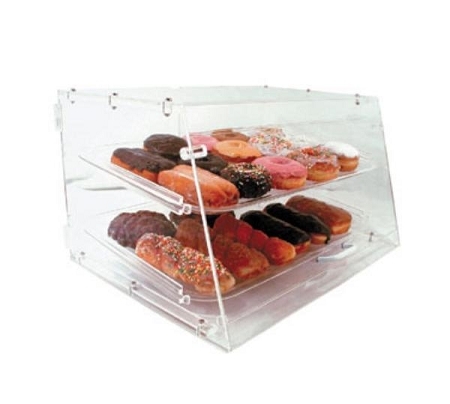 This Clear Acrylic Pastry Display Case will send your sales skyrocketing by showcasing your baked goods. Your customers are going to leap with joy when they get a good view of your sweet treats. 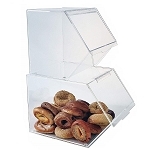 With slide out trays and acrylic handles these bakery containers are great for customers to self-serve, making it the perfect accessory for a buffet. Serve up your favorites whether its bagels, donuts or homemade bread. Maintain freshness with this acrylic bakery display. Simply order yours today at All Candy Containers..
Dimensions: 21" x 17 1/4" x 12"
Sturdy twin-hinged rear doors for easy access.